Make hay while the sun shines…. the saying goes. 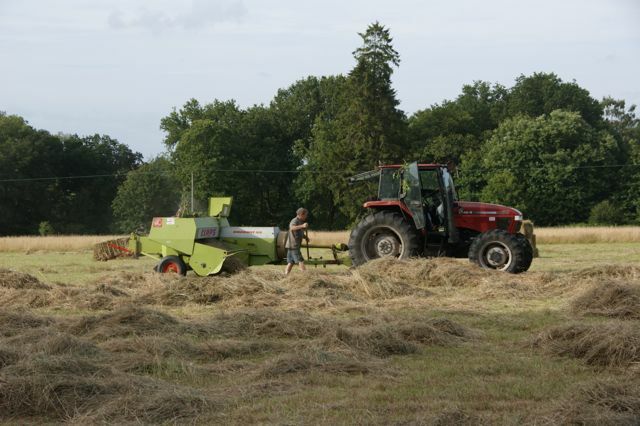 And how right it is – a little while ago we cut the first half of grass in Roundabouts field and after a few nice days some of our regulars learned how to use our ‘new’ baler and most of the initial bales ended up collected by our grazier Gareth. Following that success we cut the second half and have been waiting to bale and collect it ever since. Sadly the weather had other ideas and the jury is still out if the hay can be salvaged. The joys of weather dependent work! nature reserve or safari park? 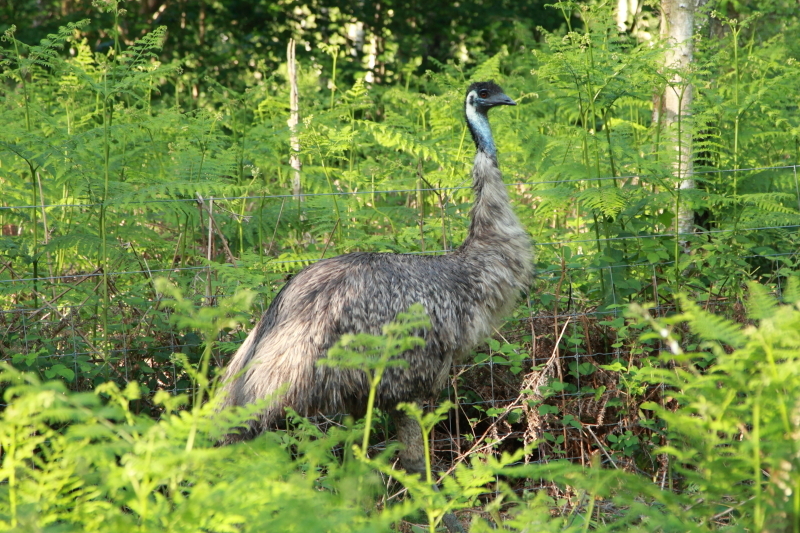 At the weekend we started to get reports that an emu had been spotted on the commons. The bird seemed not too shy and was marching along the fence near the log pile before disappearing into the undergrowth. By Tuesday the likely owner had been tracked down and arrived with a party of helpers to try and recapture the escapee who was quite happy to be approached with a bucket of feed but…. 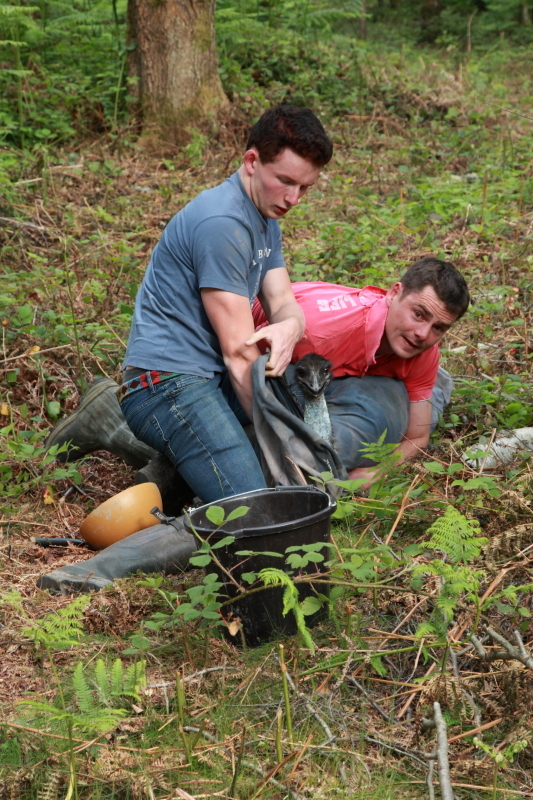 these two strong young men had their hands full trying to restrain and secure the bird so he could safely be put into a trailer. Let’s just say I would not like to be at the receiving end of his kicks! Let’s hope he has settled in back home and gets over his wanderlust. 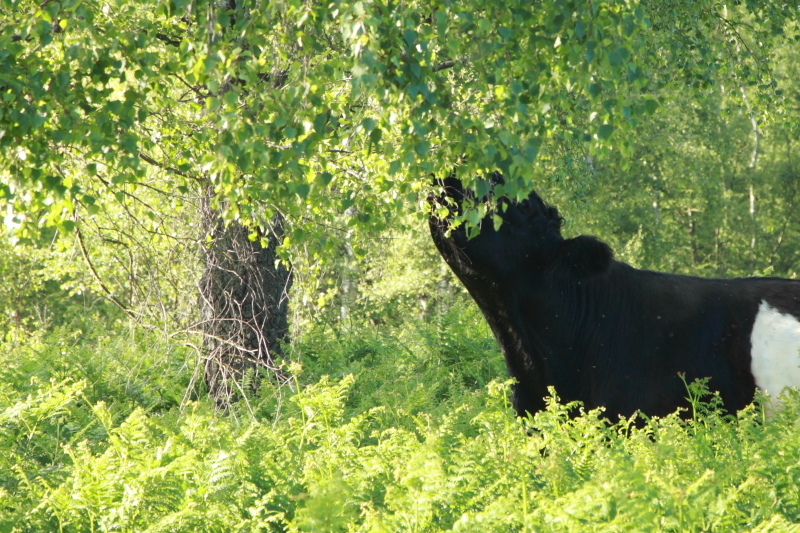 Below a picture that proves that our new cows have read their job description and are grazing on birch as well as grass. If you go down to the woods………. 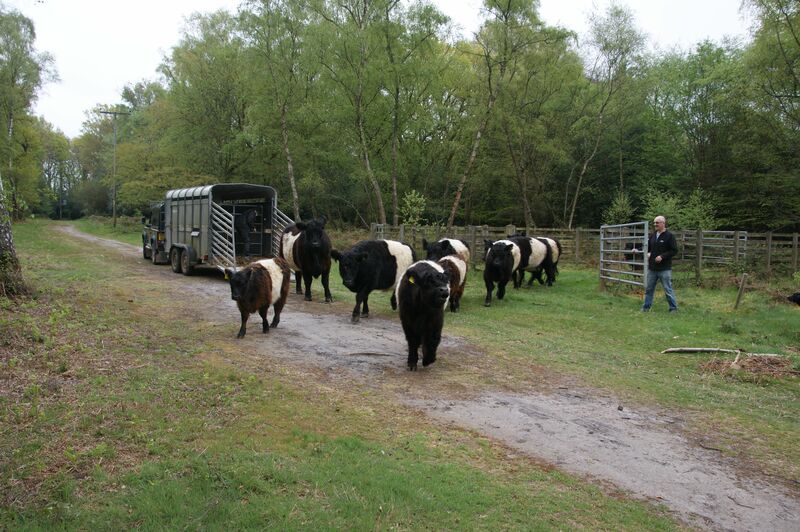 something black and white amongst the trees …..
Our latest helpers – some Belted Galloway Cattle to help with grazing and browsing to keep the Commons open and under control. 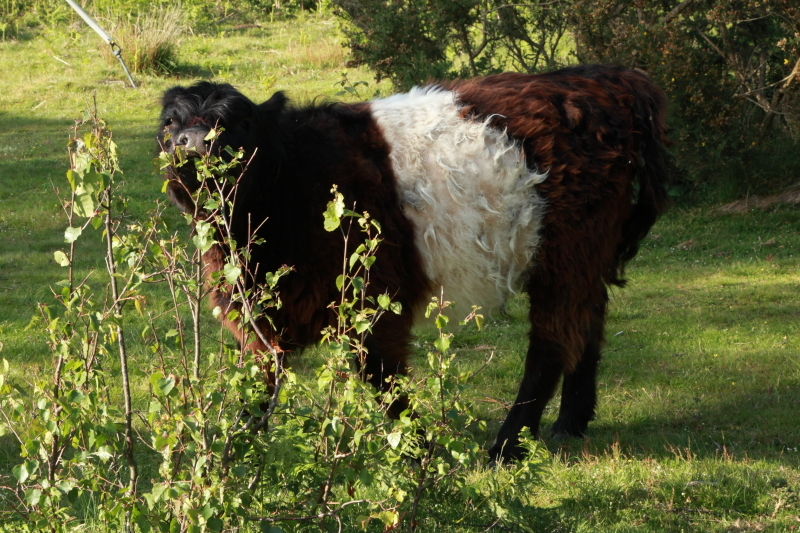 There are 12 on Lynchmere Common, cows with calves, young heifers and one rather large but very benign and relaxed steer. 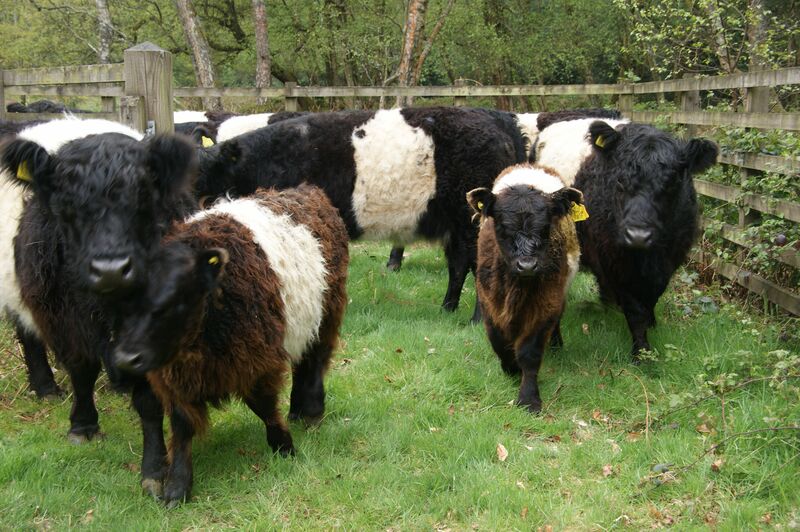 Galloways are widely used for conservation grazing and are a very calm breed of cattle but we ask that they are treated with respect – especially if you walk your dog on the Commons. 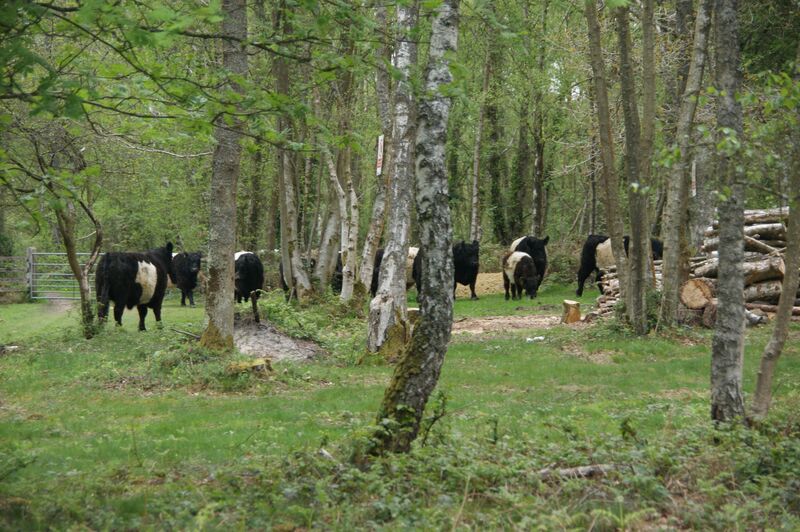 On the Little Common there will be 3 Sussex and 2 Galloways. 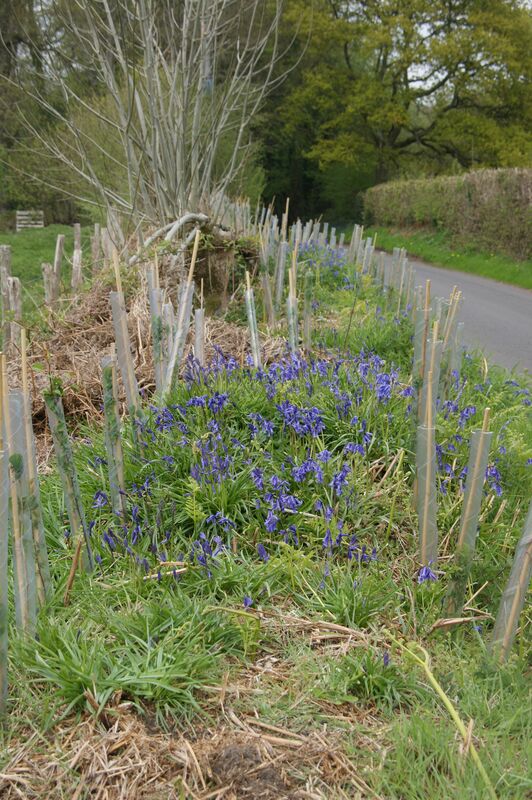 Looking a whole lot nicer with a lovely lot of bluebells filling the gap between the ‘artistically’ curving hedge lines. Most saplings are in leaf so all seems well. and our band of helpers that spend a couple of hours in glorious sunshine planting a double hedge on top (mostly) of our boundary bank at Roundabouts Field. The woodland Trust had kindly given us another 420 hazel, blackthorn, crabapple, dog rose and elder saplings complete with bamboo canes and spiral tree guards to join the ones we planted earlier this winter. 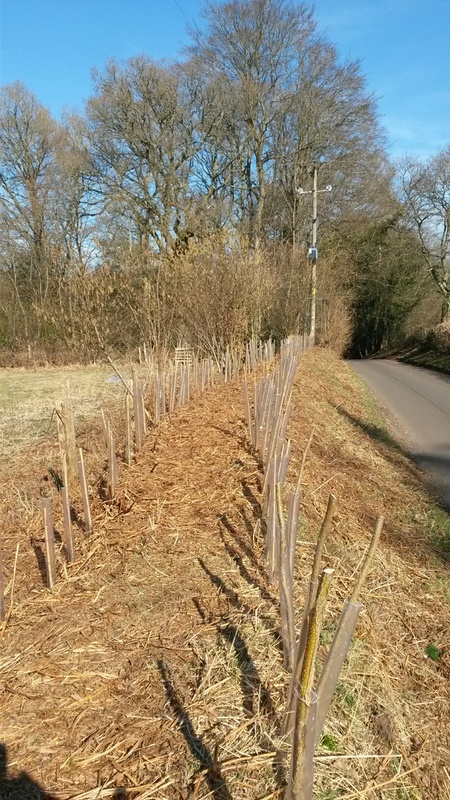 Our hedge is now complete and looks quite good – from the right vantage point. On the other hand it looks as if we enjoyed a bit more than just coffee and cake while planting it in a somewhat drunken looking line. But our excuse is the fact that nature abhors straight lines, the bank is uneven, rabbits make holes in it etc etc. Once the trees are established and the tree guards gone nobody will notice. 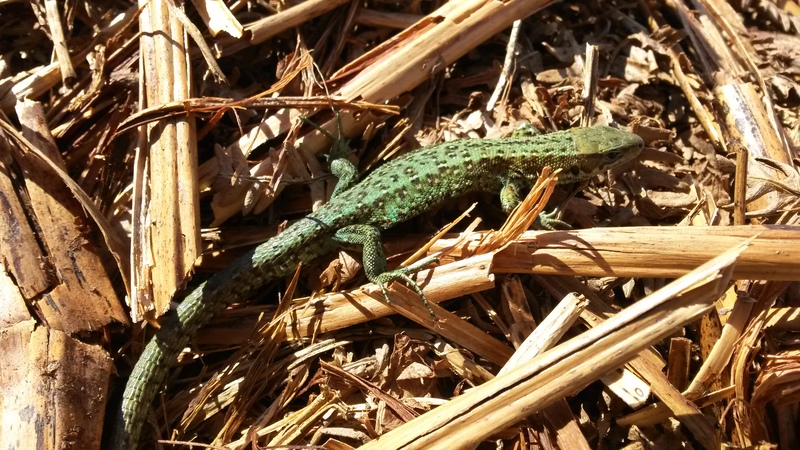 a gorgeous little common lizard – he sat there for ages basking and let us come quite close while he flattened himself to absorb as much sun as possible. In addition to the 105 saplings we planted in awful weather in November, we received have another 420 thanks to The Woodland Trust. Please come and give us a hand on Saturday 7 March to get them into the ground along the field edge at Roundabouts near Lynchmere Green. We are aiming to have a complete double hedge along this boundary bank which will in due course be laid. the saplings are as before hazel, blackthorn, elder, crab apple and dog rose. 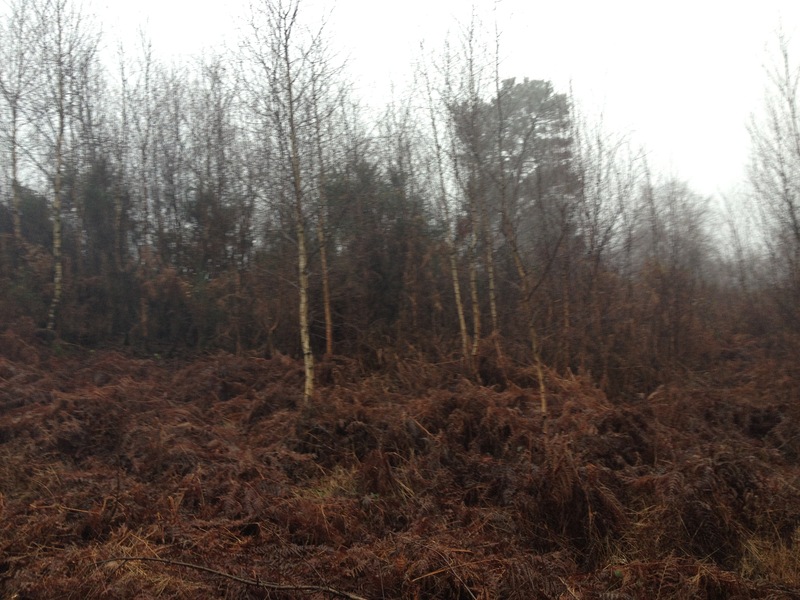 We need to clear a bit of existing bracken and bramble, plant the whips and put tree guards round them. Let’s hope we have enough willing helpers at the usual time from 10.00 to 12.30. It seems blog entries are like London buses – none for ages and then two come along at the same time. Just before many of us finally go back to work we had a chance to obtain some beanpoles and pea sticks – all while clearing some birch of course. Amazing what just a handful of helpers can achieve, there is also a huge pile of cut birch that will be turned into bean poles, pea sticks, besoms and even coasters by Mark Allery our woodsman. So nothing goes to waste even if it all looks rather radical. Winter is the main season for our felling team to carry out the necessary tree clearance work. 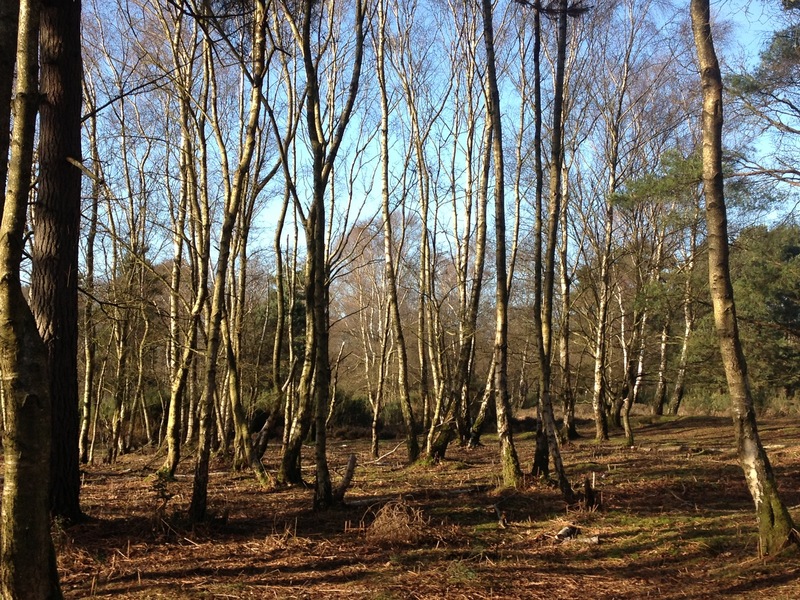 The Commons are managed primarily as a lowland heath habitat – that means we are obliged to keep the trees under control. Given half a chance – or just a few years of neglect – most of our british landscapes will first revert to scrub and then to woodland. Post WWII aerial photographs of Lynchmere Common show an almost totally treeless heath – and look at it now! Birch is a relatively short lived pioneer species that readily regrows even if cut down. Just have a look at some of the areas we clear this winter in a few months time. 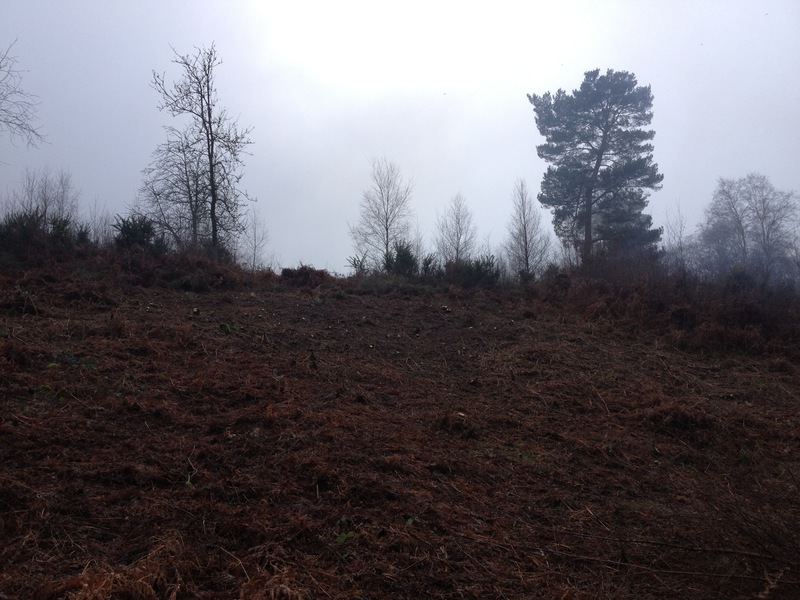 Felling trees opens up areas were we also try to control bracken, it lets more sunlight in and this will hopefully help heather re-establishment. The felled trees are de-branched and the resulting small branches and twigs – the brash – is burnt on site while the rest is cut up for firewood. 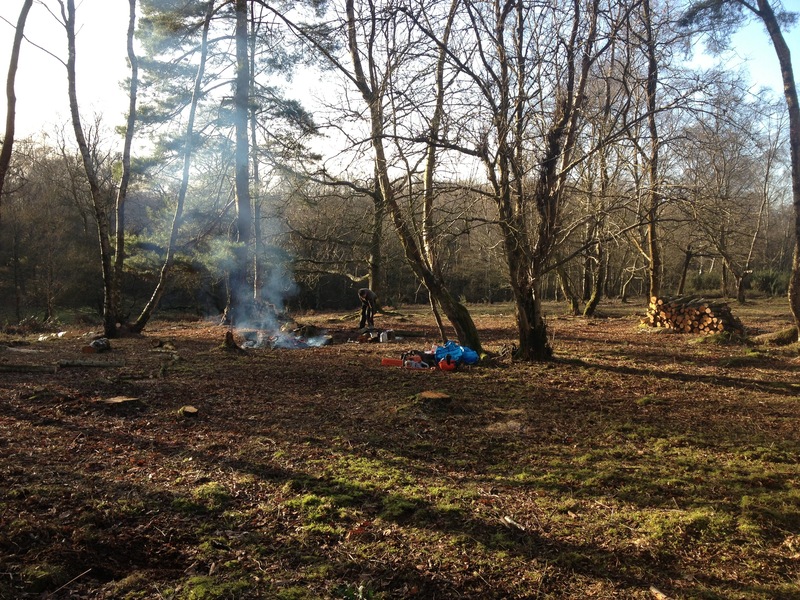 There is still more felling to be done in this area on Little Lynchmere but it certainly gave us a chance to enjoy some of the nice weather over the Christmas break.